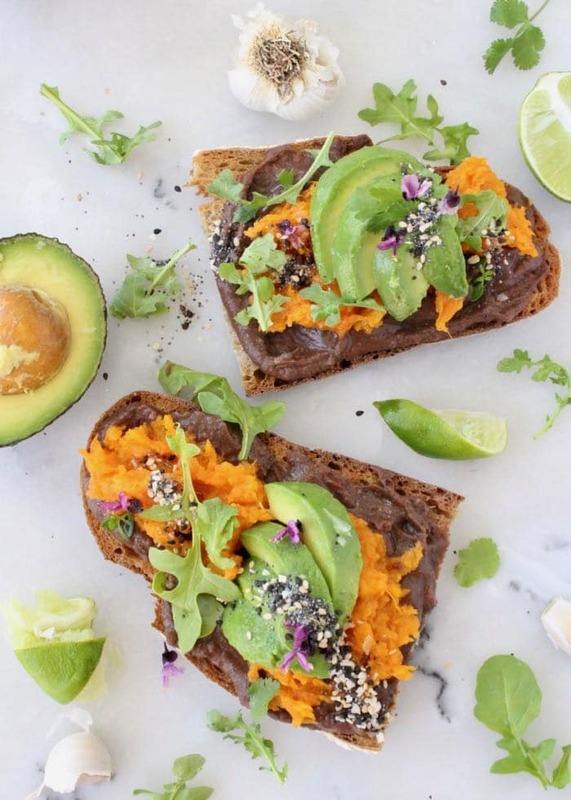 The best sweet potato avocado tartine recipe with creamy black beans, roasted sweet potatoes and arugula sprinkled with my homemade everything bagel seasoning. WFPB Vegan! What is a Tartine you Ask ? A: A French style open face sandwich made with crusty country bread. 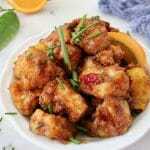 This is one of my favorite appetizers, lunches, breakfast and go to last minute dinners no matter the season. 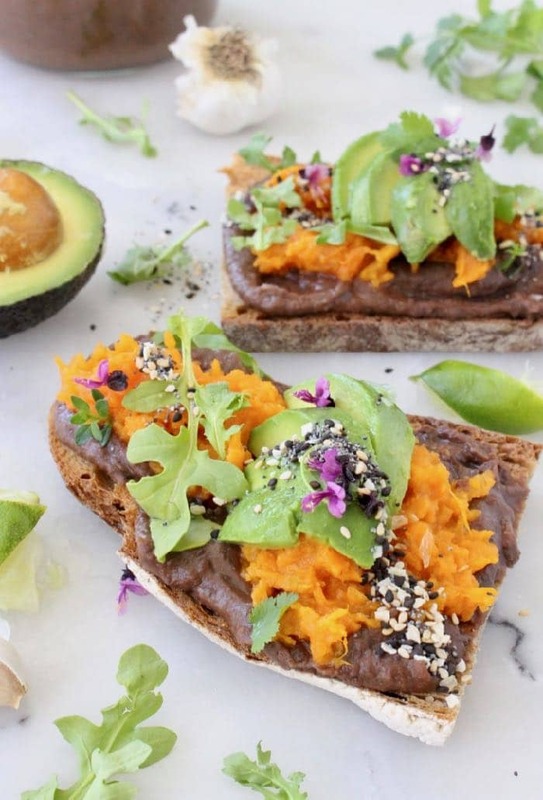 Since you can always find a big pot of beans in my refrigerator, and plenty of roasted sweet potatoes, these tartines are really a breeze to put together. 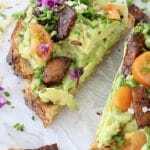 Somewhat of a copycat of the “ Le Pain Quotidien “ avocado tartine I like to order when brunching there. 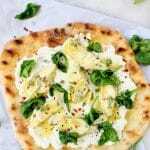 I also pick up one of their large whole-wheat loaves of bread about once a week to have around just for this and of course to make a lot of this avocado bruschetta. 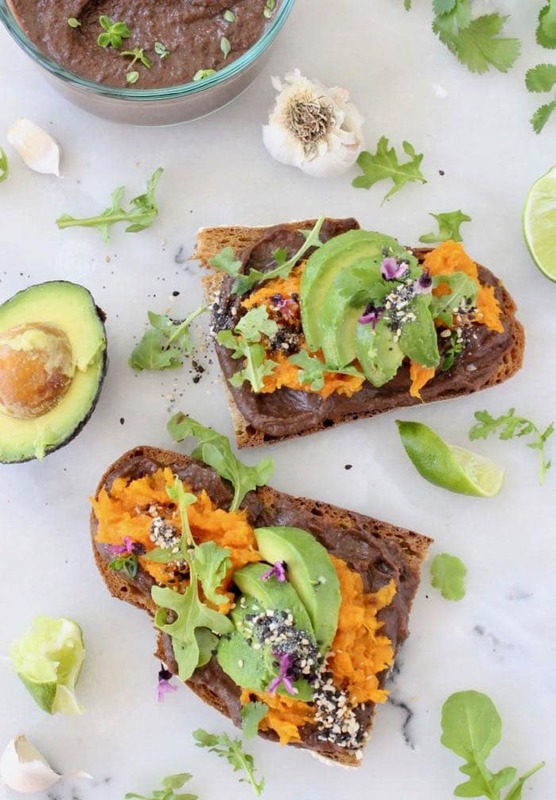 This tartine is sure to hit the spot any time of the day, so I hope you’ll keep it in your plant powered awesome life! 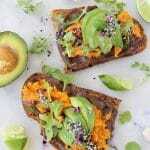 To die for sweet potato vegan avocado tartine with creamy black beans, roasted sweet potatoes and arugula sprinkled with my homemade everything bagel seasoning. 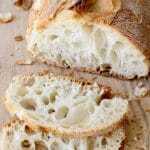 Lightly toast the bread to your liking then rub one side of each slice of toast with the garlic clove. Spread a layer of the black beans on top and hit it with a squeeze of lime. 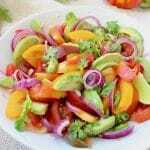 Scoop some of the sweet potatoes on top and finish with the sliced avocados. 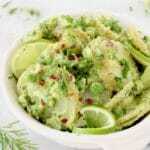 Sprinkle with the everything bagel seasonings all over to taste and top with the arugula and another squeeze of lime. These were a major hit with the entire family so I’m going to make my weekly batch of beans to have handy for this nutritious meal. So easy to throw together once you have you preprepped ingredients. Another keeper, thank you so much! My favorite new breakfast addiction. I prep everything on Sunday and have lovely meals all week long, super tasty and also pretty.